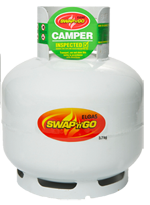 LPG gas bottles for BBQ and camping come in two standard gas cylinder sizes: 9kg & 4kg. Capacity and energy based on 3.7kg and 8.5kg fill amounts. 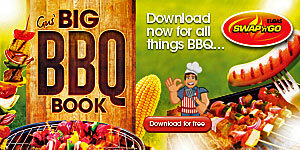 The standard BBQ valve in Australia is a POL valve. There is also a Camper valve fitted to 4kg camper cylinders. Camper valves are for appliances designed for Camper valve use. 9kg & 4kg are typical propane bottle sizes for BBQ and camping but there can also be exceptions outside of these ranges. 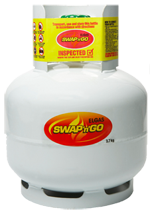 As there are many manufacturers of BBQ gas bottles and gas cylinders, dimensions may vary significantly. There are also propane bottle sizes for homes and business including 45kg, 90kg and 210kg. If you live in the UK, you have different choices in gas bottle sizes. Why 8.5kg and 3.7kg Refills? There are many LPG bottles that are labelled as 9kg or 4kg that are actually manufactured undersize, with less than the labelled capacity. This is a result of the manufacturing and design variances amongst the many manufacturers. To take into account these cylinder size variations, refills were standardised on 8.5kg and 3.7kg. This allows for the size variances between bottles and prevents any unsafe overfilling. To make sure that consumers are fully informed, the bottles are labelled accordingly.